Wow, what a busy several weeks it has been! I've been wanting to blog but haven't found a spare moment. Work has completely taken over my life and since I actually get paid to do that, I thought I should probably prioritize my real job over blogging. My goal is now to get back on track and hopefully even up my post quota. Thanks for reading! Ursa Major Fantastic Face Wash -- This has a great sweet/salty/minty smell that's like a mojito and/or margarita in a bottle depending on which scents you more strongly pick up. Either way it's a cocktail for your face. Since it's on the face for such I short time, I can't get overly worked up about face wash...unless is Liz Earle Cleanse & Polish, which I'm obsessed with. I wouldn't purchase this Ursa Major face wash because I much prefer the creamy types. My second favorite to Liz Earle is Lancome Creme Radiance Cream-to-Foam Cleanser. Scalisi Skincare Anti-Aging Moisturizer Broad Spectrum SPF 30 -- I hate reviewing anti-aging Birchbox products because the samples are way too small to use long enough to know if there are any age-defying benefits. So while I can't speak to that aspect, I liked the consistency. It was kind of thick and creamy, but not overly heavy. It's great that it's SPF 30. 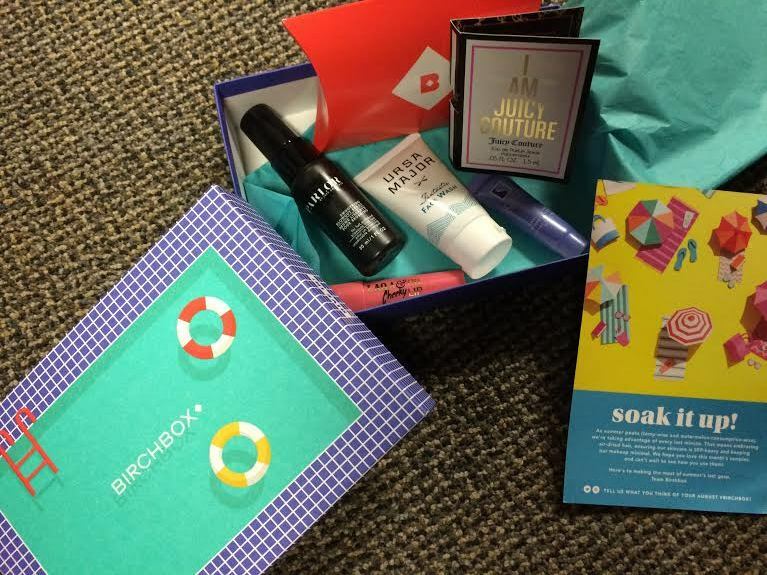 The Birchbox website states, "it smells amazing- the faintly floral scent is a far cry from eau de SPF." I beg to differ. It smells like sunscreen with a hint of some other scent. I find it hard for products to mask that sunscreen smell, although you probably wouldn't want them to load up on fragrances just to cover it up. While I don't like that SPF smell at all, I suffer through it knowing it's protecting my skin and preventing wrinkles. I am Juicy Couture Eau de Parfum -- I really like sweet smells, but I wouldn't say I love them for an everyday scent. I like a confectionery-like fragrances much more for candles than for perfumes. This one was a little fruity, a little musky and a little woodsy. When I'm in the mood for a sweet scent, this is a good one. Although, I tend to like sweet scents that are heavily vanilla-based, and I don't get a lot of vanilla out of this one. PARLOR by Jeff Chastain Smoothing Blowout Spray -- I cannot fathom how anyone with fine hair can use this! I HATED it! It turned my hair into a flat, greasy mess. I had to use multiple dry shampoos to breathe some life back into it. If I had had time, I would have re-washed it. This was just terrible. The Birchbox description said, "This Smoothing Blowout Spray ensures a beautiful result every time." No, it does not. "The lightweight spritz adds instant volume..." quite the opposite! I guess it MIGHT work for someone with very, thick dry hair, but for me, it was just awful. I enjoyed your August BB review...I went with the Candidly Nicole Guest Editor box which I loved!! Love Juicy perfume and I love the Humbly lip color!